Growing up, I was never into trying on makeup or getting my nails done or doing the usual super “girly” things. I was the obnoxious one who shouted “Eww” when I saw friends paint their nails or apply lipstick/makeup every day. “It’s just so, ugh”. Looks like those tables have turned. Although becoming an artist or a beautician is something I can never see myself doing, trying to “get fancy” on myself, by myself, is sort of a new hobby of mine. I started wanting to paint my nails ever since INGLOT aka the “prayer permissible” that is not really “prayer permissible” nail polish came to market. (It does not work the way people claim it does. Trust me, I did the experiment). I will however like to give a shout-out to INGLOT because once I applied it, I said “Wait, this is kind of cute”. Not because of the brand, but because of the product itself. Whaaattt? I’ve been holding back on applying bright colors onto my nails whenever I want for twenty-three years? That’s cray. As for makeup, that too is something I recently started playing around with. It went from everyday eyeliner, to that plus foundation, to all of that plus blush. (Eyeshadows are for occasions only). While messing around and acting like I knew what I was doing, I’ve FINALLY found the products I’m most comfortable with. 1. 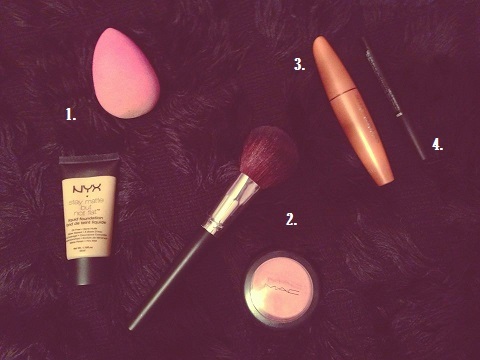 Apply Foundation with the Beauty Blender. Oh man. I always thought I would overdose on applying liquid foundation but surprisingly it’s not so bad. Maybe all of that thanks goes to the Beauty Blender. This pink sponge is just…it’s just… I have no words. Buy it for yourself, please. 2. Apply a little Blush. Rosey cheeks are too cutie. Do it. 3. Apply eyeliner/mascara. I ALWAYS wear eyeliner. If I don’t, people bombard me with questions like “What’s wrong? Are you okay? Everything okay?” or “You look terrible, no sleep?”. I AM ACTUALLY DOING REALLY WELL, I JUST DID NOT APPLY EYELINER OKAY, JEEZ. Mascara is like whatever to me, If I remember to wear it, I wear it. I was blessed with long lashes so I’m good without it too.